14th – 15th March: A day off in Cartagena saw the crew split into 2 halves, the “elders” were a little more interested in the history and architecture of this Spanish city that seems to going through a bit of an identity crisis, blending the old with the new and not quite achieving either. I mentioned 2 halves, the skipper was cooking the evening meal “bangers and mash” for 18.30 followed with a night departure to Benidorm, so back on-board by 18.30 was the order of the day. Cartagena has a large university which happened to be celebrating with a live open-air concert. 3000 students were raving from around mid-day, like bees to honey and making a bee-line were descriptive actions that applied to the younger members of the crew. The elders were back on-board 17.45 and were soon showing signs of quiet consternation as to whether the 18.30 deadline would be observed. By 18.15 talk of keel hauling and “cat O nine tails” were being discussed by the newly formed “Elders committee”. By 18.25 five jolly crew scrambled on-board and much to everyone’s relief settled down to a hearty traditional evening meal. By 19.45, the lines were slipped and the crew of Kukri were once more heading out into the dark and blue yonder – destination Benidorm. The watches settled down to a relatively calm windless evening. It’s a strange phenomenon at sea when the mind and body start to move into a state of observational irrationality, a case in point occurred at around 02.10hrs when the Mate had just come on watch, Wayne from Hong Kong asked the Mate what type of ship that was on the horizon – it had an orange glow and resembled (with a good imagination) a ship –ish. The Mate pronounced the “ship” as the Moon and asked Wayne to keep a vigilant eye on it as it was likely to ascend into the sky and change colour to white. Wayne thought he was having the mickey taken out him and dismissed the Mates explanation – 15mins later the “orange ship” was now bright white floating high above the Mediterranean sea. Wayne’s only comment before going off watch was “Oh!! – it IS the moon” The point behind this little story is that when we are told to keep an eye out for ship’s – the mind has a wonderful way of interpreting the most obvious shapes into what we “want to see” and not what is actually there especially in the early hours of the morning. 07.00 saw the wind freshenand back to a steady 5, gusting 6 and put us on a dead beat. The mate had promised the crew, a full English breakfast – with Kukri on her ear, the cooker gimballing like a possessed seesaw with tomatoes and mushrooms making high leaping bids for freedom, landing on the cabin sole and scurrying (in-line) to the far corners of the boat. Perseverance and a dogged determination to deliver on one’s promise saw the crew tuck in to bacon sausage, scrambled egg, tomatoes and mushrooms. Honour restored and a happy ship. 16.00hrs saw Kukri safely moored in a marina 5 miles from Benidorm. 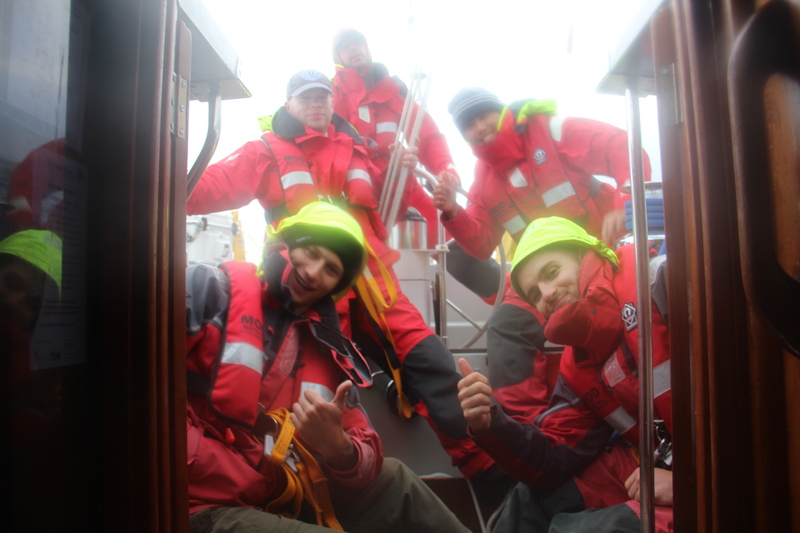 With crew moral high, 6 days at sea, 490Nm and 50 night hours under their belt, the time was right to award each member of the crew with an enrolment gift to an exclusive members only off-shore only sailing community called “the Port & Starboard Club” – the gift, a pair of bamboo socks, one red one green. Simple rules – any member can call a committee meeting at any time – anyone not wearing or in possession of their socks is requested to carry out a forfeit by the rest of the crew – a forfeit always has to be in good taste and have an educational element associated with it hopefully with a nautical theme or tradition. That evening we all went out for a meal to a very nice restaurant and whilst seated at the table – yes you’ve guessed it – someone called a Port & Starboard committee meeting. The chair (1st Mate) commanded a right leg show, with 10 legs raised in the air 9 green socks were counted – a left leg show was called and again 10 legs were raised and 9 red socks were counted – Oh dear !! “Disco” was improperly dressed and a forfeit is now pending. Benidorm’s reputation as an attraction for social entertainment was not lost on the crew. It’s truly amazing the impact that having one too many beers can have on one’s ability to carry out life’s simplest of tasks – as was observed back on board. Army Air Corps helicopter pilots are probably the most highly trained and skilled pilots of any military in the world. Their precision and accuracy of positioning an aircraft in any environment is legendary. Back on board, this same highly trained pilot was having tremendous difficulty in navigating a landing pad just 4 feet high and 6 feet long. All personal on-board instruments were clearly malfunctioning, directional stability sensors were temperamental at best, night vision aids were no longer an advantage, and so it was – like all well trained pilots on a mission, one sometimes has to throw caution to the wind and Go For It, what then proceeded can be best described as do or die mission – target bunk firmly in the sights – legs cocked and spring loaded – Launch!! – body and bunk connected in a fashion which allowed time for said highly trained pilot to reassess the situation and after a short fight with a very stubborn sleeping bag – Chopper Watts was safe and in the prone position to enjoy some well-earned rest. 16th March: Slipped lines and headed south for Alicante, it was time to do some serious fishing, Alicante was a mere 15nm away and so trolling at 2-3kns was guaranteed to catch some fish for supper – Wasn’t it !!. Not L. We even had a shark trailing the lures for at least a mile but still nothing and soon the wind picked up and we were on beam reach doing over 7 knots, time to knock fishing on the head for another day. 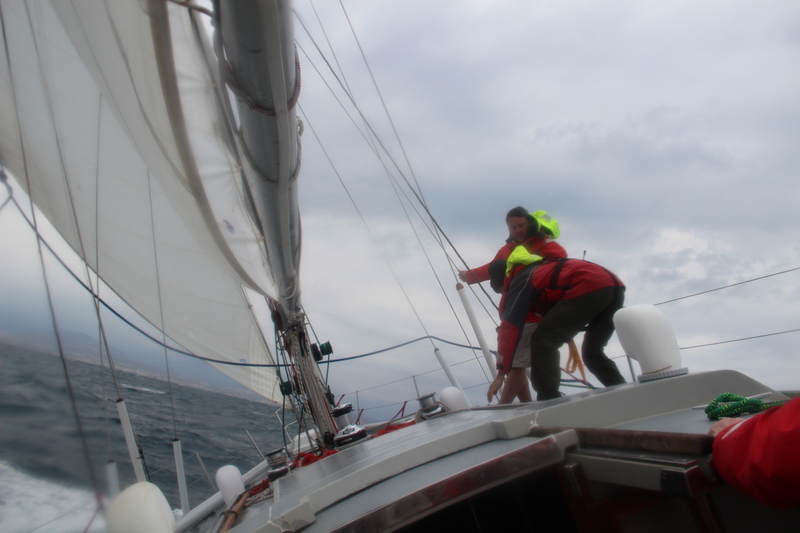 Before mooring up in Alicante, the Skipper decided to practice anchoring – depth of water 4m. So in true military fashion the anchor chain was flaked on deck, the anchor trip line attached and set to 5m, we also decided to demonstrate anchoring with the mainsail up. The anchor was deployed and dug in, the anchor ball was hoisted, bearings and transits jotted down. An anchor watch and how it works was explained to the crew. The opportunity also was taken to take our 4 potential comp crew through their final knowledge and practical tests which they have been practising all week. Knots, parts of the boat, points of sail, rowing and all the other skills were tested. Delighted with the results and competency of the crew, the skipper declared that he would sign off their skill requirements and that we now had 4 new Competent Crew for Army Air Corp. Congratulations to Wayne, Dixie, Lynchy & Bow. With anchor weighed we headed into Alicante – refuelled and found a berth for the night, Tomorrow we have a new Skipper joining us. To close this section of our blog it just remains for me on behalf of the crew to say a big thank you Stuart Southwick for making the first week of leg 2 such a fantastic experience, we all hope to have the privilege of sailing with you again in the future.